Another great repellent using DEET as its main secret weapon is Cutter Backwoods Insect Repellent. United Industries Corporation is the creator of this biting insect deterrent and is a very reputable formulator that also makes the Repel line of repellents. It seems that many of the global brand manufacturers have been aggressively entering into the natural market for several years now. This is of most likely due to the strong consumer demand for more natural based products, all driven by concerns some have with applying DEET to their bodies. Regardless of your preference, there are suitable occasions for natural or chemical based repellents. 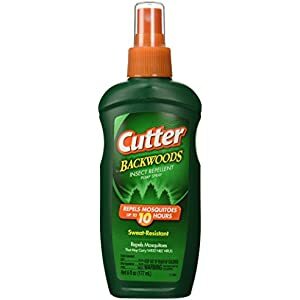 Meaning, when you are in an environment where mosquitoes may be carrying deadly virus strains, you will certainly want to reach for Cutter Backwoods Insect Repellent. That is because only a handful of products can help shield against the Chikungunya, Zika, Dengue and West Nile viruses. Keeping in line with an identical competing brand reviewed, my impartial rating for Cutter Backwoods is 4.2 out of 5 stars. As with other products containing 25% DEET, Cutter protects against Zika and other serious viruses. Can be applied to children over 2 months old. Sweat-resistant and has a 360° spray pump that sprays at any angle. Fragrance is slightly strong, but not terrible for most users. Only certain mosquito repellent products can lay claim to shield you and your family from mosquitoes that carry potential deadly diseases. The reason for this is, the EPA also known as the Environmental Protection Agency, is an agency that governs personal insect repellents along with what repellent wording each manufacturer may use on its product labeling. I think this is very important to note in my review of this item because when personal or family safety is at risk, you will want to be sure that the mosquito repellent you are applying is going to provide adequate protection. Knowing this, selecting the right insect repellent for your situation becomes much easier. You see, manufacturers are responsible to comply with the EPA guidelines, which in turn, are designed to reduce public risk. And that’s a good thing! This product is not overbearing as far as the odor goes. It is fine for most users, primarily due to the fact that other products containing upwards of 95% DEET can be very overwhelming to your senses. Mostly, the smell of this product is that of a chemical and it does fade down once rubbed into your skin. Since this formula claims to be sweat resistant, it should last through a moderate amount of perspiration or humidity. But of course we have to use some common sense and not take for granted that this repellent will stay on just fine after a full day of intense sports. The solution to excess persipiration is easy enough though, merely reapply as needed and inline with the product labeling. Unlike some other chemicals, this 25% DEET based product is ok to apply to children over 2 months old. I often peruse the FDA site to keep up with current recommendations concerning different ingredients and the last time I checked, DEET still had the green light for kids. Only certain repellents can claim to protect against mosquito born viruses such as Dengue, chikungunya and Zika. Sadly, in 2016, a rash of mosquito induced diseases started showing up in South America, and has now spread to many areas of the United States. As of this writing, just under 9000 cases of Zika infection have been documented, with some of them fatal. Safe for use on kids over 2 months of age. Swivel applicator applies clear and does not feel tacky after absorbing into your skin. Contains DEET at 25%, known to offer excellent protection. Manufactured by a reputable company with years of global repellent experience. Weaker towelettes at 0.475 oz., and various sizes at 4, 6, 7.5 and 11 oz. The active ingredient, DEET, strikes fear into the minds of some people and there is a great amount of controversy as to whether the risks of applying this chemical to your skin, outweighs the benefits. You could spend hours online researching and discover countless articles detailing the dangerous side effects of DEET, even at very low levels. Conversely, during my research I was also bombarded with information explaining that DEET was an excellent choice to keep mosquitoes away, and is not detrimental to people. For me, I am comfortable using the best natural all natural mosquito repellent currently available but I strongly advise that you pick the right repellent for you and your family based on what you are comfortable with and in line with EPA guidelines. I am rating this product at a 4.2 stars because it is a proven performer and has the identical amount of ingredients as a competing brands that have been reviewed here. Cutter Backwoods Insect Repellent is tried and tested, and will help shield you against some very serious mosquito borne diseases that are radically changing the landscape of our countries safety. When in doubt, trust the EPA guidelines and regardless of where you are, always avoid mosquitoes as best you can, for safeties sake.